What do you do when those reunion notices show up for your high school graduating class? How the hell do those people find you, anyway? I’ve always hypothesized that there must be some branch of the FBI connected to the process. While they’re going through your files, one agent’s job is to say, “Hmmm…looks like this guy has a high school reunion to attend. I’ll send his name to the committee!” Regardless of how it arrives in my mailbox, I make sure to dispose of it quickly. Sometimes I even use a flamethrower. After reading The Detained by Kristopher Triana, you may start behaving like I do. One thing’s for damn sure…You will never be eager to attend a high school reunion again. The people who attend Bonneville High’s class reunion arrive with agendas in place. They’re ready to show off what they’ve become in their years away. But it’s kind of hard to impress a crowd when there’s only a total of five people. That, and not everyone has been exactly burning up the red carpet. Two of the characters are embittered people who looked to be going places in the unstable hierarchy that is high school life, only to trip up and fall badly when they reached the real world. Number three is an old school gym teacher, now retired and out of it. The last two people are overachievers who felt the call to rise above and beyond what was not a great start. All five have secrets. One thing that binds them all together is their contact with a young man named Graham Mullen. Poor Mullen was the classic high school nerd, but not of the cheerful, pocket protector grade. No, this guy was the frail dreamer and lover of the world depicted in comic books. Guys like Graham Mullen are like butterflies missing a wing. They’re fascinating in a grotesque way and SO satisfying to smash under one’s biology textbook. Just listen to that crunch! Yeah baby! But it’s not much fun for normal people to watch a creature so intent on getting away from its tormentors that it destroys itself. Like when Mullen blows himself away in the boys’ bathroom. Everyone else in this special little reunion got to leave Bonneville High School for a while and do something different. Graham Mullen didn’t. He got trapped inside the place he hated. FOREVER. No kids, no career, no chance to live out his dreams, and as his miserable gym teacher said, “Son…you’re gonna die a virgin.” Most likely he did. Stuck in purgatory for over twenty years gives a soul the chance to build up some serious energy and tonight it’s Graham Mullen’s chance to be in charge. There may be a way for his guests to save themselves, but it’s up to them to find it. As the old saying goes, “The truth will set you free.” But will anyone in the group of five be strong enough to face it? 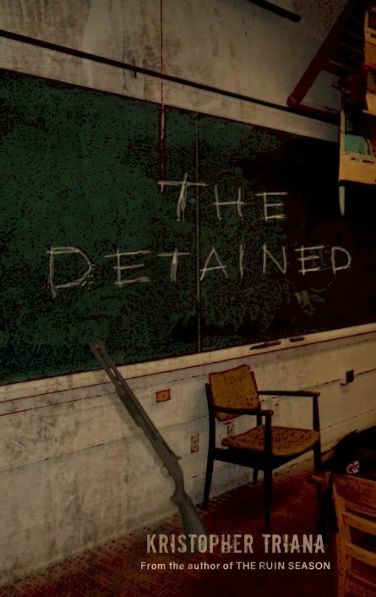 To get the answer to that question and more, you need to get yourself a copy of The Detained by Kristopher Triana, brought to you by the folks with the coolest logo – Perpetual Motion Machine Publishing. This is a real five-star book written in a very believable way that will have you turning pages long after midnight! Triana keeps building the suspense while pushing us slowly over the edge into no man’s land. The Detained will crush you with its truths, but redeem a lost soul with honesty. Kristopher Triana has written a book that holds up a funhouse mirror to show us that we’re still the scariest creatures walking the planet. Trust me, you need this book!